Fit for royalty, this majestic crown will make a royal favor for all Kings and Queens at your next function! Blow your guests away with this stunning gift favor! Everyone wants to feel like royalty from time to time and this all-metal crown will certainly do that. Beautifully crafted with a silver finish, it resembles a classic fairy tale crown in miniature. The ornate curves of the crown are decorated with an abundance of sparkly raised beaded accents giving it a rich and luxurious appeal. The crown comes beautifully packaged, nestling on a cushion of plush black felt. A little 'For You' tag attached with a soft white organza ribbon will give each guest that ultimate grandiose feeling. 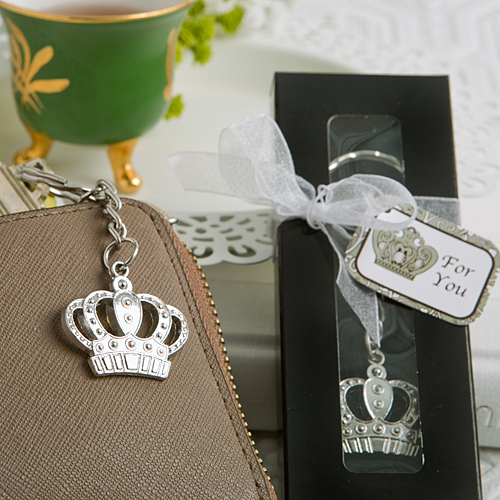 This is an ideal favor for weddings, showers, birthdays and other royal occasions. You can be sure your guests will put these little crowns to good use and will remember your event for years to come. Crown size is 1 1/8" x 3/4"
Silver metal chain length is 3"
Chain attaches to a silver metal key ring.